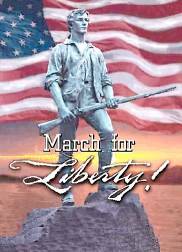 Give Me Liberty Or Give Me Death - Patrick Henry, March 23, 1775. Patrick Henry, St. John's Church, March 23, 1775. In March 1775, at the third Virginia convention, held in St. John's Church in Richmond, to discuss relations with Great Britain, Patrick Henry made his timeless "Give Me Liberty or Give Me Death!" speech. King George had declared all 13 North American colonies to be in a state of open rebellion. Lord Dunsmore, the Royal Governor of Virginia, had ordered all the gunpowder in Williamsburg seized and stored aboard his ship anchored in the Virginia harbor, to keep it out of the hands local patriot forces. Patrick Henry, then a Virginia militia Colonel, with his militia troops faced down Lord Dunmore, forcing the British Governor in the famous "Gunpowder Affair" to return the large quantity of gunpowder which had been set aside for the Virginia militia by the Colonial legislature. 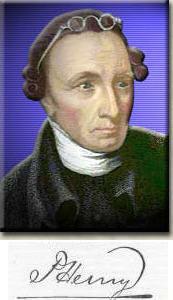 For this action, Patrick Henry became thereafter "Public Enemy No. 1" in the eyes of the British. Ever since those days, the Bill of Rights 2nd Amendment "Right to Bear Arms" (including gunpowder) has been a precious liberty and guarantee of freedom for Virginians and all Americans. It has been and is the defense against despotism and tyranny by government, then and now. Listen to The Colonial Williamsburg Foundation - Richard Schuman's re-oration of Patrick Henry's powerful words spoken March 23, 1775 at St. John's Henrico Parish Church in Richmond, Virginia as you read the text. It is as timely and to the point now as it was then in 1775. No man, Mr. President, thinks more highly than I do of the patriotism, as well as abilities, of the very honourable gentlemen who have just addressed this House. But different men often see the same subject in different lights; and, therefore, I hope it will not be thought disrespectful of those worthy gentlemen if, entertaining as I do opinions of a character very opposite to theirs, I shall speak forth my sentiments freely and without reserve. This is no time for ceremony. The question before this House is one of awful moment to the country. For my own part, I consider it as nothing less than a question of freedom, or slavery; and in proportion to the magnitude of the subject ought to be the freedom of the debate. It is only in this way that we can hope to arrive at truth, and fulfill the great responsibility which we hold to God and our country. Should I keep back my opinions at such a time, through fear of giving offense, I should consider myself as guilty of treason towards my country, and of an act of disloyalty toward the Majesty of Heaven, which I revere above all earthly kings. I have but one lamp by which my feet are guided, and that is the lamp of experience. I know of no way of judging of the future but by the past. And judging by the past, I should wish to know what there has been in the conduct of the British ministry for the last ten years to justify those hopes with which gentlemen have been pleased to solace themselves and the members of this House. Is it that insidious smile with which our petition has been lately received? Trust it not, sir; it will prove a snare to your feet. Suffer not yourselves to be betrayed with a kiss. Ask yourselves how this gracious reception of our petition comports with those warlike preparations which cover our waters and darken our land. Are fleets and armies necessary to a work of love and reconciliation? Have we shown ourselves so unwilling to be reconciled that force must be called in to win back our love? Let us not deceive ourselves, sir. These are the implements of war and subjugation; the last arguments to which kings resort. I ask gentlemen, sir, what means this martial array, if its purpose be not to force us to submission? Can gentlemen assign any other possible motive for it? Has Great Britain any enemy, in this quarter of the world, to call for all this accumulation of navies and armies? No, sir, she has none. They are meant for us: they can be meant for no other. They are sent over to bind and rivet upon us those chains which the British ministry have been so long forging. And what have we to oppose to them? Shall we try argument? Sir, we have been trying that for the last ten years. Have we anything new to offer upon the subject? Nothing. We have held the subject up in every light of which it is capable; but it has been all in vain. Shall we resort to entreaty and humble supplication? What terms shall we find which have not been already exhausted? Let us not, I beseech you, sir, deceive ourselves. Sir, we have done everything that could be done to avert the storm which is now coming on. We have petitioned; we have remonstrated; we have supplicated; we have prostrated ourselves before the throne, and have implored its interposition to arrest the tyrannical hands of the ministry and Parliament. Our petitions have been slighted; our remonstrances have produced additional violence and insult; our supplications have been disregarded; and we have been spurned, with contempt, from the foot of the throne! In vain, after these things, may we indulge the fond hope of peace and reconciliation. There is no longer any room for hope. If we wish to be free -- if we mean to preserve inviolate those inestimable privileges for which we have been so long contending -- if we mean not basely to abandon the noble struggle in which we have been so long engaged, and which we have pledged ourselves never to abandon until the glorious object of our contest shall be obtained -- we must fight! I repeat it, sir, we must fight! An appeal to arms and to the God of hosts is all that is left us! They tell us, sir, that we are weak; unable to cope with so formidable an adversary. But when shall we be stronger? Will it be the next week, or the next year? Will it be when we are totally disarmed, and when a British guard shall be stationed in every house? Shall we gather strength by irresolution and inaction? Shall we acquire the means of effectual resistance by lying supinely on our backs and hugging the delusive phantom of hope, until our enemies shall have bound us hand and foot? Sir, we are not weak if we make a proper use of those means which the God of nature hath placed in our power. The millions of people, armed in the holy cause of liberty, and in such a country as that which we possess, are invincible by any force which our enemy can send against us. Besides, sir, we shall not fight our battles alone. There is a just God who presides over the destinies of nations, and who will raise up friends to fight our battles for us. The battle, sir, is not to the strong alone; it is to the vigilant, the active, the brave. Besides, sir, we have no election. If we were base enough to desire it, it is now too late to retire from the contest. There is no retreat but in submission and slavery! Our chains are forged! Their clanking may be heard on the plains of Boston! The war is inevitable--and let it come! I repeat it, sir, let it come. It is important to know the kind of man who gave that speech, a man who contributed so much to the founding of our nation. In 1764 he moved to Louisa county, Virginia, where, as a lawyer, he argued in defense of broad voting rights (suffrage) before the House of Burgesses. The following year he was elected to the House and soon became its leading radical member. It was that year that he proposed the Virginia Stamp Act Resolutions. Few members of the Burgesses, as aristocratic a group of legislators as existed in the colonies, would argue openly for defiance of Great Britain and the throne. Henry, considered one of the greatest orators of all time, argued with remarkable eloquence and fervor in favor of the five acts, which by most accounts amounted to a treason against the mother country. In 1774 he represented Virginia in the First Continental Congress where he continued in the role of firebrand. At the outbreak of the revolution, he returned to his native state and lead militia in defense of Virginia's gunpowder store, when the royal Governor spirited it aboard a British ship. Henry continually spoke out against British tyranny, and in 1775 his famous "Give Me Liberty or Give Me Death" speech, above, motivated the Virginia Provincial Convention to bear arms against England and then to vote for independence from England. In 1776, Henry was elected Governor of Virginia. He was re-elected for three terms and was then succeeded by Thomas Jefferson. He was again elected to the office in 1784. Henry was a strong critic of the constitution proposed in 1787. He was in favor of the strongest possible government for the individual states, and a weak federal government. He was most critical of the fact that the constitutional convention was conducted in secret. As Governor of Virginia, Patrick Henry and his frontiersmen fought successful wars on several fronts during the American Revolution. Henry supplied men from Virginia for Washington's Continentals, the regular army. He also supplied men to fight from the state militia forces, aided Daniel Boone and his westerners in Kentucky, which was then a part of Virginia, in holding the Kentucky territory for the Revolutionary forces. And Henry solidly backed Colonel George Rogers Clark in winning the vast Northwest, Ohio, Indiana and Illinois from the British. Clark's victories there held that territory for America during the negotiations for peace which settled the war with England. Governor Henry ensured that a religious freedom section was included in the Virginia Constitution in July 1776 at the time of Virginia's independence and his election as its first Governor, personally drafting the religious freedom section of the state constitution. The official state church of Virginia under its colonial royal government prior to independence was the Anglican church, the so-called "established church," from which the phrase "Establishment of Religion" in the Bill of Rights is derived. Henry and others, notably Jefferson, successfully fought for religious freedom in Virginia against the "Established" Anglican church, elimating any state sanctioned and supported churches. Governor Henry and Governor George Clinton of New York led the fight for Religious Freedom, Freedom of Speech and the other Bill of Rights guarantees, forcing Virginia Congressman James Madison to introduce a Bill of Rights to the First United States Congress in June 1789, which were approved by the Congress in September 1789 and sent to the states for ratification in order to prevent misconstruction or abuse of the powers granted to the Federal government in the Constitution. These Declaratory and Restrictive amendments, holding a position in law superior to the original Constitution, were ratified December 15, 1791. See Bill of Rights. President Washington appointed Henry Secretary of State in 1795, but Henry declined the office. In 1799, President Adams appointed him envoy to France, but failing health required him to decline this office too. He died on the sixth of June, 1799 at the age of sixty-two.